Double chin injections arrived in Australia in March 2017. The Manse Clinic , which is in the eastern suburbs near the Sydney CBD, has performed the most treatments in NSW and Australia so far. Please see our double chin before and after gallery. It has a brand name in Australia and USA, but we are not able to write these names online. It is an injection that dissolves fat. The Australian product is approved for the removal of under chin fat. It is an effective, permanent, safe and gradual non-surgical injectable treatment to reshape the jawline by dissolving the double chin fat. 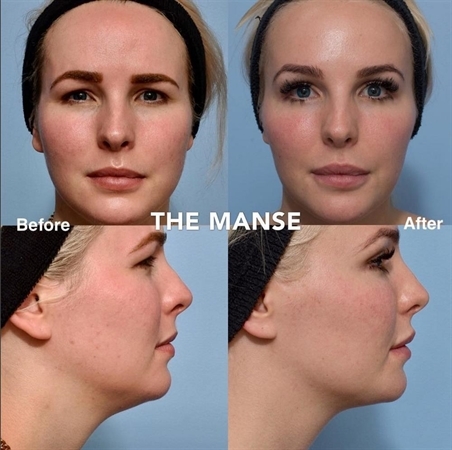 The injection can be used to sculpt the neck and create a chiselled jawline, creating a youthful profile. 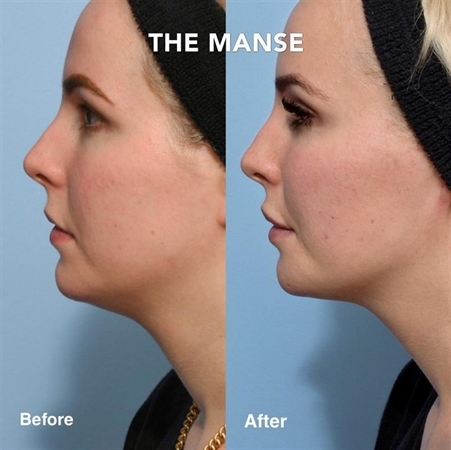 Doctors can now contour and lift the neck the way that we have been contouring and lifting the cheeks! Patients hate their double chins, they are unhappy with their jawlines, it make them feel they look fat, people think they’ve gained weight, and they hate how they look on profile when they catch a glimpse of their side view. They also hate photos and even avoid them. This drug is clinically proven to reduce the appearance of sub mental fullness. The treatment is tailored to suit each patients’s anatomy and circumstances, and the satisfaction rate is very high, with 75% of patients reporting satisfaction with the appearance of their face and chin after treatment. After treatments, patients report an improvement in self perceptions. Based on their improved chin profile, patients reported feeling happier and younger less embarassed, less bothered and less self conscious. Double chin dissolver will also be very popular with those patients who are obsessed with looking natural, as it doesn’t affect facial expression or features, which is important for that patient group. Keep watching our instagram as many of the staff in the clinic, including Dr Naomi, Dr Adina, our therapists and our receptionists, have had the treatment and we will be showing it all on social media! Are people concerned about their chin profile? In Australia 59% of women said that they are concerned about a double chin. This figure is more than the number of those who are bothered by their forehead lines! 41% of men are concerned about their chin profile. Of those who are concerned about their chin profile, the majority are aged 31-60 years old. How do patients try and cope with their double chins? Patients are working hard to avoid evidence of their double chins. They wear scarves, big jewellery. , the men grow beards, the women contour with makeup. Many lift their heads and avoid unflattering poses like looking down. When they take selfies they lift the camera high and edit, edit, edit! How exhausting! What is holding people back from having treatments? Patients worry about safety and cost. They fear invasive treatment. Also some just see it as non-urgent or a low priority, so they postpone the treatment. Importantly, one of the main reasons holding the public back is that they are unaware that there are treatments available for double chins. The drug contains an acid (which we are not allowed to name in Australia), which also occurs naturally in the body and aids the breakdown and absorption of dietary fat. The double chin injections breaks down fat cells when injected into the neck fat below the chin. The body then absorbs the fat. When injected subcutaneously, the acid disrupts the membranes of adipocytes (fat cells) leading to irreversible cell breakdown (adipocytolysis). The adipocytolysis elicits a mild, local physiological inflammatory tissue response, which is largely resolved within about 28 days. Fibroblast cells appear and begin to produce new collagen, and there is thickening of fibrous septa within the subcutaneous tissue. How many double chin injection treatments are required? Are double chin injections permanent? The side effects of double chin injections include the following; Pain, bruising swelling, redness and numbness. Some patients experience bleeding, induration (areas of firmness) and itching and paraesthesia. Rare side effects include nodules, necrosis and transient neuropraxia of a facial nerve which causes smile asymmetry In long term follow up no adverse effects on skin laxity were noted. The patient will have a consultation where their face and neck will be evaluated and a history taken to make sure that they are suitable for the treatment. The patient will be cleaned and the grid will then be applied, which will allow the doctor to find the correct dosage for the individual, and then the patients will know the number of vials and therefore cost of the procedure. The patients will then be injected. They will hold ice afterwards for 10 minutes. Panadol is suitable for pain relief, Anti inflammatories and steroids should be avoided, as the inflammatory response may be an important part of treatment success. Happy gas will be offered to patients for pain relief during the procedure. What to do after double chin injections treatment? An appointment should be made for 8 weeks after the treatment for review and follow up treatment. What are the other options for neck fat? Neck liposuction is the main competitor for neck fat dissolving injections. Neck liposuction is less appealing to patients because it is more invasive, more downtime is required, and and small holes are created with a scalpel in the procedure. Also, a liposuction compression garment is required afterwards, which makes it a procedure with significant downtime. Kybella is non-surgical, no time off work is required, the downtime is minimal, and there is a gradual change in appearance.